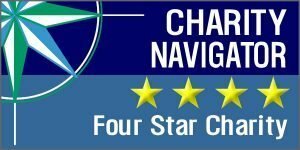 NOURISH PIERCE COUNTY IS PROUD TO BE RECOGNIZED AS A FOUR STAR CHARITY BY CHARITY NAVIGATOR. THIS RATING MEANS WE’VE TAKEN THE STEPS TO HAVE STRONG FINANCIAL HEALTH AND ACCOUNTABILITY! Spanaway Island Fest Food Drive for Nourish! at the 3rd annual Spanaway Island Festival on Saturday August 11, 2018!! Kelly is like many members of her generation. She works two jobs and has a difficult time making ends meet. Unlike many others, Kelly is not only supporting herself but also her mother and father, and is helping put her brother through college. Food is but one consideration for the 40-year-old landscaper. Her mother suffers from lymphoma and lives in a house with no electricity (heat is from a wood stove). Her father has Alzheimer’s disease. And we’ve all heard what a burden tuition bills can be. Kelly says she focuses on meats and dried beans to create stews that can last up to a week. On her food bank trips she also admits to picking up two of her guilty pleasures – mac and cheese and cereal. Those are two items she would otherwise forego in order to provide for the rest of her family. Kelly says she had tried other food banks in the past but she found Nourish Pierce County to be uniquely welcoming. At other agencies she says she was grilled about her income which she admits may look too high for nutritional aid until one takes into account her other responsibilities. She is quick to smile and announce that her brother will graduate from college soon. Once that financial load is lifted, she is ready to give back to those who helped her. Join us at noon on Oct. 9 for our annual luncheon, A Place at Our Table at the Hotel Murano. Program: Noon – 1 p.m. Admission: While the luncheon is free, a request for donations will be made. Debbie tears up when she talks about her trips to the Nourish Pierce County food bank. “It’s just temporary … just temporary,” she says. She and her husband recently suffered through a series of difficulties and suddenly found themselves not able to make ends meet. “Since I lost my job, we’re on one income for five people,” Debbie says. She was working in a warehouse and making a decent wage, but physical limitations and trying to “keep up with the kids” left her out in the cold. Adding to the woes, both her car and her husband’s died on their way to work just a few weeks apart. After 12 years without car payments, they now have two. “And the people in the food bank make you feel welcome. Not like you’re some kind of loser,” she says. Debbie walks the walk about her food bank friendships. Shortly after she walked away from this interview she took off her scarf so her friend’s dog could be sheltered against the nasty cold. Thank you for giving generously to help the hungry in Pierce County. 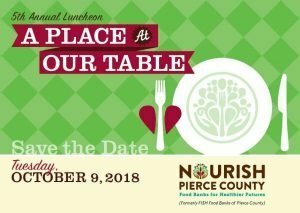 Get all the latest Nourish Pierce County news first!